File extension dav is mostly known to be used for a special video format from several digital video recorders (for exampleDVR365, DVR-1600HP, etc.) as well as CCTV security solutions from several different manufacturers, including DVR365, AlienDVR or Mace. The dav file represents video recording in a specially modified version o MPEG format saved in the SightBoss Central Station software which is installed on the DVR. These dav files are also encrypted so they cannot be played by standard media players with MPEG support. A special playback software (DVR365) is needed to view the footage. iMovie and FCE is a wonderful tool to help you turn your home videos into professional eye-catching movies. It normally can recognize a few file formats like DV, MOV, M4V, MP4 and some AVI files from cams. While DAV is not supported. In order to import DAV files to iMovie and FCE for editing, you’ll need to convert DAV to iMovie and FCE compatible video format. Since Apple Intermediate Codec is the the most compatible codec introduced by Apple which ensures maximum editing quality and efficiency when working with iMovie and FCE, the quick option is to get a Mac DAV to AIC Converter to convert DAV to AIC codec for iMovie and FCE. The process to convert the files to AIC is fairly easy and fast as long as you have such a tool like UFUSoft Video Converter for Mac. The program is a professional yet all-in-one video conversion tool. With it, you can easily rewrap all DAV files to Apple Intermediate Codec for using in iMovie and FCE. The main features of this DAV to iMovie/FCE converter for Mac are high conversion speed with zero quality loss and supporting to convert from and to more than 70 formats like MP4, AVI, FLV, WMV, VOB, MOV, etc. Just download it and follow the tutorial below to convert DAV to AIC MOV for editing in iMovie and FCE. Drag and drop DAV videos to the application. Or you can click “Add Video” button to browse and locate your source video files. The app supports batch conversion, so you can add more than one file at one time. The Profile tray locates in the buttom of the window. Go to the “Editing Software” category and select “iMovie and FCE” (AIC codec encoded MOV) preset as the output format. By selecting the “iMovie and FCE” or “ProRes” preset, you needn’t to adjust the video settings like video format, video resolution, frame rate and more by yourself. Tip: Of course, if you’re not satisfied with the settings, you can just click the “Settings” icon to customize the video/audio settings including the Bitrate of Video and Audio, Audio, Video Size, Sample Rate, Frame Rate, Audio Channels, etc. 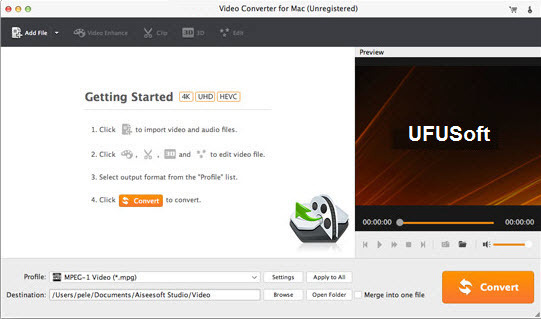 Once you press the “Convert” button, the DAV Video Converter for Mac begins to work for you. Just a few minutes later, it is done. When finished, the output AIC encoded MOV file is ready for being imported to iMovie and FCE for editing.